Posted 1/18/2018 12:12pm by Amber Stenson. Those are the four main ingredients for all cooking according to Samin Nosrat, author of Salt, Fat, Acid, Heat: Mastering the elements of good cooking. For those experiencing that winter slump of recipe inspiration, I highly recommend checking this book out. Samin does a great job of teaching you how to cook with just about anything in your kitchen, and make it taste great! Heres an excerpt from the book. The Single Most Important Ingredient. One week left to take advantage of our Early Bird Discount for your 2018 CSA. Sign-up by January 31st to receive $35 off a Full Acre Share and $20 off a Half Acre share. Use the following codes at checkout. How about a recipe to keep you warm and full this winter! Nosrat grew up eating traditional Persian dishes, like the Iranian frittata known as kuku sabzi; her mother’s version was greener than anyone else’s. “She was a health food freak and grew up on a farm and believed in packing as many greens and herbs in there as possible. I’ve never seen a kuku as full of green things as hers.” The chef’s version is at least as verdant. “It’s so insanely green, and healthy, and spring, and fresh-tasting and different. And it reminds me of my mom,” she says, enthusiastically. You can make it with whatever fresh herbs and leafy stems you can get your hands on — Nosrat has friends who make it with lettuce. 1. Preheat the oven to 350 degrees if you do not want to flip your kuku partway through cooking. 2. If using chard, strip the leaves: Gripping at the base of each stem with one hand, pinch the stem with the other hand and pull upward to strip the leaf. Repeat with remaining chard. 3. Gently heat a large cast iron or nonstick frying pan over medium heat and add 2 tablespoons of olive oil. Add in the chard leaves, or other greens, and season with salt. Cook, stirring occasionally, until the leaves are wilted, about 4 to 5 minutes. Remove from the heat, set aside and allow to cool. 4. If using chard, thinly slice the stems, discarding any tough bits at the base. 5. Return the pan to the stove and heat over a medium flame. Add 2 tablespoons each of butter and olive oil. When the butter begins to foam, add the sliced leeks and chard stems, along with a pinch of salt. Cook until tender and translucent, 15 to 20 minutes. Stir from time to time, and if needed, add a splash of water, reduce the flame, or cover with a lid or a piece of parchment paper to entrap steam and keep color from developing. 6. In the meantime, squeeze the cooked chard (or nettles or spinach) leaves dry, then chop them roughly. Put them in a large bowl with the cilantro and dill. When the leeks and chard stems are cooked, add them to the greens. Use your hands to mix everything up evenly. Taste the mixture and season generously with salt, knowing you’re about to add a bunch of eggs to the mixture. 7. Add the eggs in, one at a time, until the mixture is just barely bound with egg — you might not need to use all nine eggs, depending on how wet your greens were and how large your eggs are. It should seem like a ridiculous amount of greens! I usually taste and adjust the mixture for salt at this point, but if you don’t want to taste raw egg, you can cook up a little test piece of kuku and adjust salt if needed. 8. Wipe out and reheat your pan over medium-high heat. (This is an important step to prevent the kuku from sticking.) Add 4 tablespoons of butter and 2 tablespoons of olive oil, then stir to combine. When the butter begins to foam, carefully pack the kuku mixture into the pan. 9. To help the kuku cook evenly, in the first few minutes of cooking, use a rubber spatula to gently pull the edges of the frittata into the center as they set. After about two minutes of this, reduce the heat to medium and let the kuku cook without touching it. You’ll know the pan is hot enough as long as the oil is gently bubbling up the sides of the kuku. 10. Because this kuku is so thick, it’ll take a while for the center to set. The key here is to not let the crust burn before the center sets. Peek at the crust by lifting the kuku with a rubber spatula, and if it’s getting too dark, too soon, then reduce the heat. Rotate the pan a quarter turn every 3 or 4 minutes to ensure even browning. 11. After about 10 minutes, gather all of your courage and prepare to flip the kuku. First, tip out as much of the cooking fat as you can into a bowl to prevent burning yourself, then flip the kuku onto a pizza pan or the back of a cookie sheet, or into another large frying pan. Add 2 tablespoons olive oil into the hot pan and slide the kuku back in to cook the second side. Cook for another 10 minutes, rotating the pan every 3 or 4 minutes. 12. If something goes awry when you try to flip, don’t freak out! It’s only lunch! Just do your best to flip the kuku, add a little more oil into the pan, and get it back into the pan in one piece. If you prefer not to flip, then slip the whole pan into the 350-degree oven and bake until the center is fully set, about 10 to 12 minutes. I like to cook it until it is just set. Check for doneness using a toothpick, or just by checking for a faint jiggle at the top of the frittata. 13. Remove from the oven when done and carefully flip out of the pan onto a plate. Eat warm, at room temperature, or cold. Posted 10/27/2017 4:24pm by Amber Stenson. Its' hard to believe the season is really over, but this early snow sure makes it feel like the right time for snuggling into a good stew or roasted veggie dinner! I hope all of you are dong just that and preparing your homes and lives for a winter of rest. On the farm we are certainly starting to hibernate, but we are also planning for next years growing season! For those as anxious as we are to taste spring arugula and salad mix, we have our 2018 CSA member sign-up ready to go. 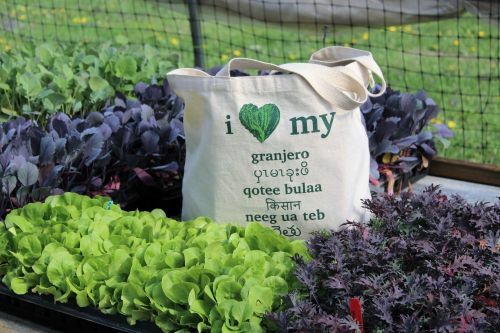 The first 10 sign-ups get a free Big River Farms tote bag showing off the word for "farmer" in seven different languages! What are you waiting for?!! If you have questions about signing up, feel free to email me at lebo@mnfoodassociation.org. Excited to see you next year! The Farm Bill and oh so much more! Posted 8/8/2017 11:04am by Amber Stenson. Its the time of year when we settle into the wealth of the fields and load our plates with the first tastes of the Solanaceae. Also known as the nightshade family, this group of vegetables embodies the flavor of waning August sunsets when you can sit on the porch eating chip after chip of fresh salsa. Most of the farmers have harvested their garlic crops and it hangs in the barn curing. Onions will come next and the mesh tables that once held tiny seedlings in the greenhouse mere months ago, will carry the weight and the stink of red and yellow onions as they too cure in the barn. Its hard to believe we are halfway done with the CSA, and yet with each passing week, there are small signs of fall in the air. I've already seen the red of sumac peeking out from the lower branches. This week we have spent time thinking about farming on a national scale having attended a Farm Bill listening session with representatives from the House Agricultural Committee. Almost every corn and soy grower emphasized the need for crop insurance. Cattle and poultry producers were concerned about the need for prevention and mitigation of potential disease outbreaks and there was a small but mighty representation of organic family farmers, most of whom are members of Land Stewardship Project. Their message was clear: Organic is a growing trend in agriculture, and small farmers need more support across the board. 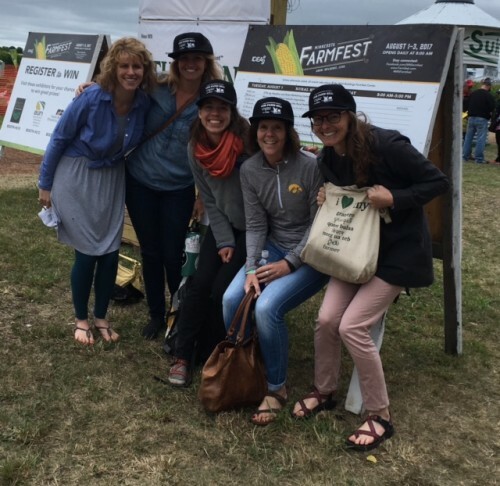 It felt good to be part of a positive movement in agriculture and to see so many farmers advocate for small, local solutions to feeding our community. Lets keep sending that message to all our representatives in hopes that the 2018 Farm Bill can be OUR farm bill not only providing assistance and support to small-scale agriculture, but helping grow the market and access to local and organic food for all consumers, no matter their income. Second Year farmer Naima Dhore is hoping to participate in a 10-day farmer to farmer exchange with Witness for Peace in Cuba this September. She is currently asking for support through her Go Fund Me page. A note on the boxes: We had hoped for Cilantro for everyone and cherry tomatoes for Full Share members. Instead of Cilantro, everyone received cucumbers and instead of tomatoes, full share members received sweet corn! Hopefully, tomatoes and more corn will drop next week! We are so thrilled to send out the first of the seasons garlic and tomatillos and hot peppers in this weeks box. The jalapeño are one of our specialty hot peppers being grown on the farm this year and they are absolutely lovely to look at. 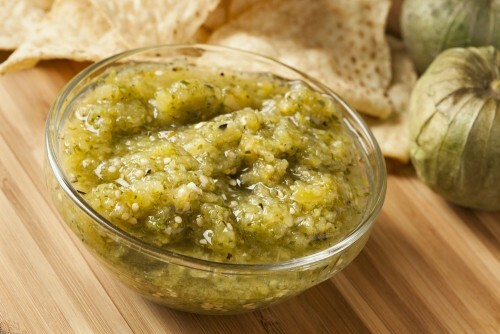 What better way to use all three than in a simple salsa. Break out your chips! Place the tomatillos in a saucepan, cover with water and bring to a boil. Reduce the heat and simmer for 8 to 10 minutes, flipping them over halfway through, until softened and olive green. Remove from the heat. Transfer to a blender. Add the jalapeño, onion, cilantro, and 1/4 cup water to the blender and blend to a coarse puree. Transfer to a bowl, add salt, and thin out as desired with water. Taste and adjust salt, and set aside for at least 30 minutes before serving, to allow the flavors to develop. Instead of boiling, you could also husk, rinse and cut the tomatillos in half and then roast them in the oven under the broiler with some olive oil and salt. Watch as they turn from bright green to a more olive shade and begin to get soft, about 5 minutes on each side. This will give the salsa a smokier flavor. Try-out the tasty Pesto-Green Bean Recipe on the card this week as well and let us know how it goes! All about the braise......and vegetables too! Posted 7/25/2017 10:19am by Amber Stenson. I think I say this every week, but really, it seems that the farm can't be more bountiful these days. We've got the first of the carrots for you all this week marking the turn to late summer crops. Before we know it our plates will be heavy with the late summer nightshade family of eggplant, tomatoes, potatoes and peppers, such a change from all the early season greens we have been munching on. Yum! This week also marks our first wholesale delivery of the season to the Columbia Heights school district. Here are Danielle and May loading up the truck! We are really excited and proud of this new relationship in sourcing local and organic food to the five schools within the district. Later in the fall we will host students at the farm and pay farmers to visit the classroom closing the loop on a full farm to school partnership! This week we are sending carrots, zucchini, and summer squash which will be chopped and frozen for stir fry mixes to be used throughout the school year. Tasty tasty! Lately I have been thinking a lot about farm workers and the labor that is needed to keep a small-scale vegetable farm afloat. The other day I saw Farmer See Nay in the field with a crew of 15 people. He told me "Weeds are expensive! "and I couldn't agree more. 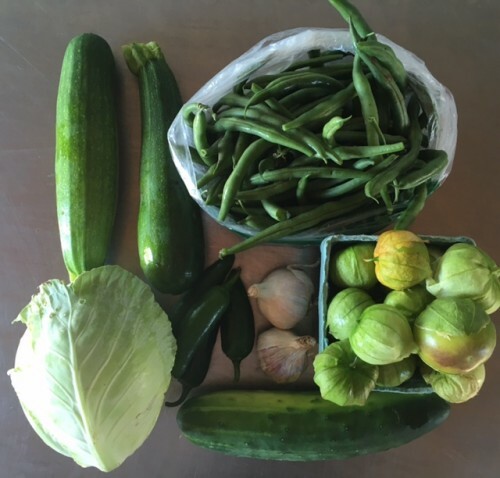 Thanks to encouragement from one of our CSA volunteers, I felt it prudent to give thanks to our CSA workers, a reliable crew who arrives at 7am on Tuesdays to sort and pack your veggies. We really couldn't do this without them. Meet Paul, Andy, Willow and Mary. Absent from the photos are Brendan and Susan who have also helped out this season. See them in action here as they move boxes along the assembly line! Working the CSA assembly line! Update: As of 2017 See Nay and 1st Karen Farm are now the 1st Karen farm to be a member owner of Shared Ground Farmers Cooperative! For those with savory tastes, I highly recommend experimenting with a simple braise with this weeks box. Braising sounds fancy, but its really quite simple. Braising is essentially a way to brown in fat and then stew vegetables or meat. I love to braise all sorts of veggies with butter, olive oil or meat drippings and the flavor melding is soooo delicious. You could easily braise your fennel, carrots and onions from this box and if you want through in your chard and zucchini! 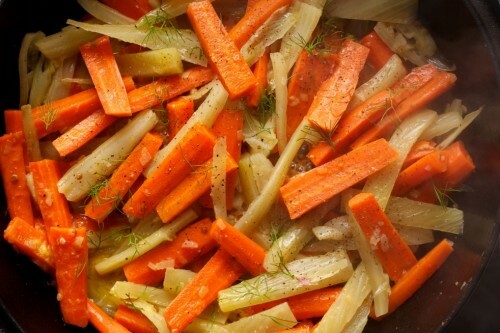 Here is a basic recipe for a fennel carrot braise from Deb Lindsey for the Washington Post. Some may think this a cold weather treat, but I love eating it warm or cold as part of a hearty grain salad or on top of a bed of sauteed greens. Melt the butter in a large skillet or shallow braising pan over medium heat. Add the shallot and coriander seed; cook for about 5 minutes, stirring occasionally, until the shallot is translucent. Trim the fennel bulb(s); if desired, reserve a handful of the fennel fronds and coarsely chop them. Cut the fennel bulb into 1/2-inch-thick wedges. Stir the orange peel and fennel into the shallot mixture until evenly coated; cook until the fennel just begins to sizzle, about 4 minutes. (This will give the fibrous fennel a head start on the quicker-cooking carrots.) Add the carrots, and season with the salt and a good pinch of pepper. Add the vermouth or wine; once it begins to bubble, add the water. Cover, and reduce the heat to medium-low; cook for about 40 minutes, stirring once or twice. Uncover; increase the heat to medium and let the liquid reduce for about 5 minutes or until it nicely coats the vegetables. Taste, and adjust the seasoning as needed. Discard the orange peel, if you like. Serve hot or warm, garnished with the fennel fronds, if using. And finally, a little bit more about fennel from our favorite naked chef, Jamie Oliver! Three cheers for Zucchini bread, am I right or what? Enjoy the recipe card this week! Posted 12/27/2016 4:43pm by Amber Stenson. A friendly reminder that our Early Bird coupon expires on January 30th so if you have been dreaming about summer produce, nows your chance to sign-up and get your discount! Just enter the following coupon codes at checkout. Nothing like local veggies to keep the winter blues away! Posted 12/12/2016 9:29am by Amber Stenson. The fields are finally laid to rest and a light snow is falling. We at the farm are busy like bees keeping the hive warm and alive during the winter, but we are also grateful for the change of pace, to rest, reflect and relish in winter's warmth. I wanted to reach out to you, our steadfast supporters, with a small reminder that it's never too early to think about summer vegetables! 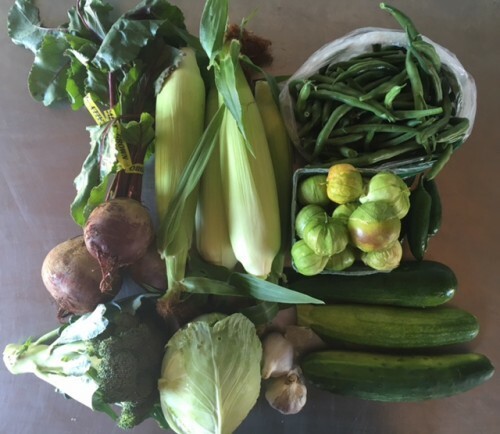 Our 2017 CSA season is already taking sign-ups. Wouldn't it be great to check that off your list? Or maybe you want to gift a CSA share to a friend this season?! Sign-up before January 2nd and get $30 off your share! Make sure to type EarlyBird2017 into the "coupon" field during check-out to add the discount to your payment. Thanks to your feedback we are making a small change to our CSA for 2017. We will continue to offer both full and half share memberships. Our half share is changing from an every other week delivery of a full box to an Every Week delivery of a half box. You get the same amount of vegetables but in smaller amounts and more regular intervals. We are also adding on an herb pot at the beginning of the season complete with an herb pocket guide to keep you stocked with tasty recipes all season long. Visit our website for more detailed info on pricing and some new drop site locations! May you find warmth, rest and peace this winter season. Posted 11/8/2016 3:15pm by Minnesota Food Association. The birds are back, and that’s a good thing. When Amy and Proeun Doeun first started farming on their current land in 2012, birds were rare. Why? No bugs to feed them. The land had been used for commercial farming, and the surrounding land, as well. Amy and Proeun were committed to organic farming, though, and set about restoring the nutrients in the soil. They used organic pest control techniques, such as spacing out the planting of cabbage to discourage moths from eating their produce. Some bugs are good bugs, after all. And now, the birds have returned -- a sign that the land is getting healthier. Amy and Proeun are graduates of the Minnesota Food Association organic farming program and say that the program was a big help in preparing them to live off the land. They say that one of the greatest benefits of the program was that in addition to learning the basics, they learned how to research the answers to questions that came up later. Proeun’s parents were farmers in Cambodia before war uprooted them. After spending five years in a refugee camp in Thailand, the family made it to America, eventually settling in Minnesota. Proeun’s parents would tell stories of how much they loved working with the land in the jungles of Cambodia, growing things, but it was Amy and Proeun’s oldest son who led them back to farming here. 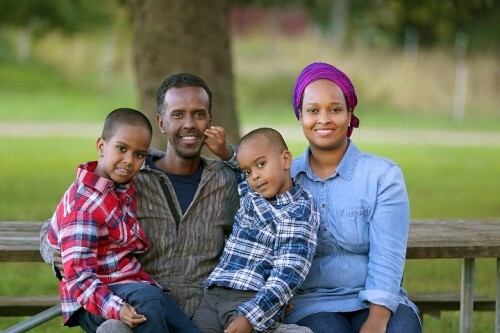 Their son, now twelve, had such an enthusiasm for farms and growing things, that Amy and Proeun began to dabble in programs they heard about at the Minnesota Living Green Expo. Eventually, they got involved in the Minnesota Food Association, and before too long, the family had moved from their urban home of a 40 x 80 foot plot to a 40-acre farm. Amy and Proeun now have six kids, with a seventh on the way, and love that their kids can run and play in wide open spaces. Amy and Proeun started farming produce, but they have been transitioning into heritage livestock, including Berkshire hogs, Galloway cows and Lincoln sheep. Their oldest son saved money to purchase cows of his own. Now that the cows are breeding, the herd is expanding. Thanks to a grant from Lakewinds Coop, they have been able to invest in fencing for their animals. While the farm operates under organic farming guidelines, the cost of certification has been a hurdle. The farm’s CSA clients love the quality of their produce, and chefs know the value of heritage animals that tend to have more flavor than commercially raised animals. Upcoming plans include offering raw fleece from their sheep, and taking a sabbatical from growing produce in order to focus on their animal herds. Amy has written a book, “Home School Farm” for her CSA clients, and anyone who is interested in seasonal living. Offering tips on when to order seeds, plant and harvest, she follows a year of living on the farm. The book may be downloaded from their website at crazyboyfarm.com. Posted 11/3/2016 1:49pm by Amber Stenson. The sun is absolutely glorious today. Absolutely. And the light is different this time of year. I have been trying to notice and pay attention to it more, especially in the context of the changing season. Despite the unseasonable weather, the earth is still turning and we are headed for some long dark days. I hope that you all lean into hibernation through winter projects, cooking and eating with friends, and some really good movie marathons! Not must to report from the farm. We will have our final Holiday Farmers Market on Nov. 13th at Bachmans. Even if you don't need produce, it is a great time to find winter flowers, local cheese, jams, mushrooms etc. Drop by our table if you happen to go! This week we have a lot of good roasters and mashers. Carrots, Brussel Sprouts, Squash, Rootabaga, Parsnip and Beets from Mhonpaj's Garden. Note: Some of you received cabbage, others got acorn squash. Melt butter in a large pot and add onion and celery, cooking until browned. Season with salt. Add the rutabaga and the broth and bring to a boil. Reduce heat, cover, and simmer until the rutabaga is fork-tender, about 30 minutes. Add the chipotle and the white pepper. Stir well. Process in a blender or food processor until smooth, and pass through a fine mesh sieve to remove any chunks. Stir in the cream and taste. Gently simmer for 15 minutes. Add more salt, white pepper, chipotle, or paprika if you think it needs it. *Note about the chipotle: this pepper is spicy! I could handle a full teaspoon of it, but it's always best to start small and work your way up where chiles are concerned. Start off with 1/4 of a teaspoon, stir, taste, and keep adding 1/4 teaspoon more until you reach your desired heat level. If you overdo it, you can cool it down with sour cream or plain yogurt. As for parsnips, well you can make parsnip hash, roast them, mash them, eat them in a salad or a pilaf or even a cake! Check out these recipes from the BBC Good Food. Happy eating and I hope you all get outside to feel the light!